Arsenal failed to turn up in the first half and blew Liverpool away in a devastating second half spell, but had to make do with a share of the points in a whirlwind game at The Emirates. Arsenal wenger again opted for four at the back and a 4-2-3-1 formation, with Ainslie Maitland-Niles and Alex Iwobi getting nods to start. The changes didn’t have much of an effect though, as Liverpool edged into the game. The first ten minutes we played with a good intensity, but our moves broke down and we gave Liverpool the initiative they needed to get into the game. Philippe Coutinho started a counter in his own half and continued his run, closely marshalled by Jack Wilshere. The delivery into the box got a crucial deflection, sending the ball skywards and Coutinho got his head on the ball to float it over Petr Cech and into the far corner. Liverpool were in the ascendancy, as they were catching us cold repeatedly. Mo Salah was looking every inch the dangerman, and Cech pulled off some impressive saves to keep the Egyptian at bay. Liverpool kept coming, and it was a real wonder how the away side were not stretching their lead, but some basic mistakes in their passing and some good work by Bellerin and Maitland-Niles were keeping the space to a minimum at crucial times. The Reds were still creating chances quite easily though. We weren’t able to escape the high press, and the pressure was building. On the 44th minute, Liverpool missed out on doubling their lead, Salah denied by a wonderful low save from Cech, and Mane acrobatically missing the rebound chance. The referee’s whistle couldn’t come quickly enough, and the second half had to bring improvement. It would take a while though. Before that, Liverpool went two up, as the pattern of the first half continued. Mo Salah got his goal, with a low shot that got a crucial clip off of second half sub Shkodran Mustafi’s leg, sending it just out of the grasp of Petr Cech. 2-0 down, at home, and looking as limp as Donald Trump’s hair. This could have gotten ugly. Instead, the response was quite terrific. Within a minute, we had woken up. This is something I’ve gotten used to as a Gooner, seemingly unable to kick into the high gears we’re capable of unless we’re under duress. This was duress indeed, but Hector Bellerin swung in a marvellous cross to the back stick, where Joe Gomez had switched off and let Alexis steal in and plant a header into the net. The fires were lit, and the crowd could sense a shift. So could the players, as two minutes later, we were level from nowhere. 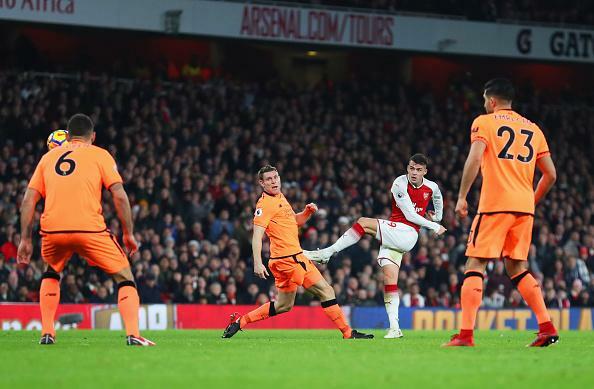 Granit Xhaka, always implored to shoot by the Gooner faithful, actually did so, and from 25 yards, his shot had plenty of fizz, but Mignolet should’ve parried it over, instead, he let the pace deceive him and the ball smashed into the net. 2-2 and we were on the crest of a big wave. This was a role reversal, Liverpool couldn’t cope with our forward impetus, and Jack, Mesut and Alexis were in their element. Two minutes later, we were ahead, and it was a beautiful goal. Mesut carried it forward, and played it into the willing Lacazette, who had his back to goal. He held it and Ozil carried his run on. Lacazette scooped the ball behind him and the ball found the German, who finished sublimely. Where had this come from? This was the Arsenal who had destroyed tottenham and should have destroyed United, this was the Gunners team that most of our opponents can’t deal with. We didn’t stop there, and we continued to knock on the door, but the two goal advantage didn’t come. We would pay for it too. It is strange to feel slightly disappointed with a draw after being two goals down, but Roberto Firmino’s 70th minute goal should have been stopped. He received the pass just inside the box and central, but he had space. His markers were nowhere to be found, and he took full advantage, his finish intending to go over Cech, but the keeper got a hand to it, but not enough to keep the ball looping in. The rest of the game was the perfect advertisement for the craziness of this competition. One attack at one end was swiftly followed by another at the other end. Both teams could have won it, but the game saw no more goals and ended all square. Wenger has still been unable to beat Klopp in five meetings, but this game could have been so much worse. We showed great resilience in getting back into the game, and our attack spluttered into life, at least for five minutes. Onwards and upwards, we go to Selhurst Park next week, with three points much needed to close the gap on the top 4.